The idea is to increase the number of journeys on your Opal card as close to the max as possible in a short time. This can save a lot of money if you have a longer commute, want to use a lot of ferries, etc. Repeat until you have enough journeys! My return journeys took about 10 minutes each as you can see in my history, but this could be a lot faster with a bicycle. You can’t ride the train when tapped off, hence why you must walk between stations (which is a lot faster in this case anyway) . If you wanted to do something similar actually riding the trains, it would take two cards. 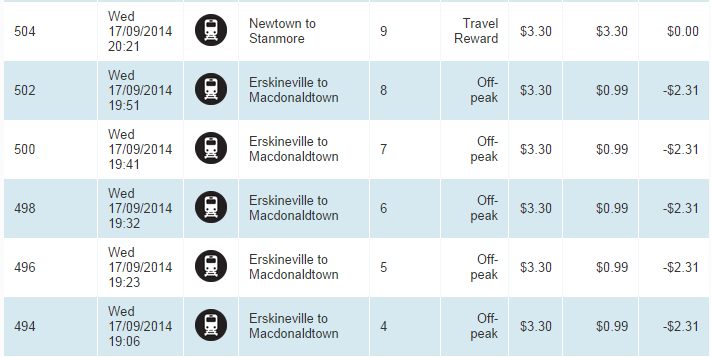 You have to stop once the daily cap of $15 is reached, which means you can only get 7 journeys this way in a single go. The above stations are picked since they are close to each other and have Opal readers (without barriers) near the footpath. This has created an incentive for people to take cheap – and potentially useless – trips early in the week to make significant savings later on. “I want people to beat the system,” Gladys Berejiklian said. “I want people to find the savings because they are there to be had,” she said. By understanding Opal’s fare structure, and what it means for your journey, you can work out ways to save even more.